At 11.02 GMT on Wednesday, the Sun crossed the Equator. And, for the next six months, the days will be longer than the nights. 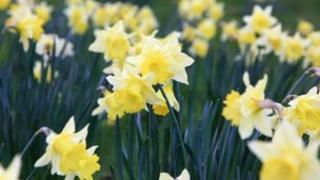 Spring has sprung - and we can finally banish the winter blues. The statistics are even more sobering. So far, March 2013 has been colder than both this winter's December and January. The average temperature (day and night combined) for the UK this March to date is currently around 3C. It should normally be nearer 6C. The chill really set in during February, and winter has dragged on ever since. The reason has been the persistence of easterly winds from a frozen Continent - winds which have chilled the North Sea to just 4C or 5C. Hardly surprising, then, that eastern parts of the UK have suffered the most. Moaning about the Great British weather is a national sport. But, when such conditions impact on our livelihood, the effects are particularly serious. And there has been much to complain about. In recent days many parts of the UK have been hit by cold weather more akin to winter. On Tuesday, more than 100 schools were closed after heavy snow affected parts of Scotland, with whiteout conditions in some areas making driving difficult. Inverness Airport's runway was closed at one point. Meanwhile, Met Office amber alerts, warnings of snowfalls and gale force winds, were issued. And, even in the hours leading up to the equinox, more light snow has been settling in north-east England and eastern Scotland, adding to large amounts of up to 10cm which hit the regions on Tuesday. Forecasters said higher ground would see up to another 5cm, while lower areas could see around 2cm - along with parts of Northern Ireland and Wales. Meanwhile, the Midlands and Lincolnshire were warned they should also prepare for the risk of light snow on Wednesday. Chilling temperatures of about just 1C are expected to keep its hold on the north of England and rise just a few degrees in the Midlands. The conditions present us with what seems to be a paradox, on the first day of spring - the Met Office warning members of the public to take care in potentially icy conditions because of the low temperatures. And this is far from the end of the cold weather. A renewed surge of bitter easterly winds will sweep across the country over the next few days, with the very real prospect of further disruptive snowfall in some areas. Friday is likely to see a return of heavier snow storms in parts of the country, such as the Midlands. For most of us, the conditions are just a minor inconvenience. But, for others, the adverse conditions that have blighted much of the country for months are far more than that. Farmers are perhaps suffering most from the cold. After such a wet year, the ongoing lack of either warm or dry weather means that many fields remain waterlogged and unworkable. Of course, what makes this March even harder to tolerate is that fact that last March was so warm - the warmest for several decades - reaching the low 20s widely during the latter part of the month. It was all thanks to a large dome of persistent high pressure, clear blue skies and strong sunshine. So, historically, how does this miserable March rate? Well, the coldest March on record was in 1962, when the mean temperature staggered to just 1.9C. That record will not be broken this year, but the more recent cold March of 1987 looks under threat - its mean temperature was 3.3C. Looking ahead, my charts look bleak. With the easterlies persisting through much of next week too, the cold could well hang on until the bitter end of March. One ray of sunshine to end on though. As the Sun gets ever stronger, it is only a matter of time before the warmth wins out. And, when spring does arrive, it will feel all the more welcome.